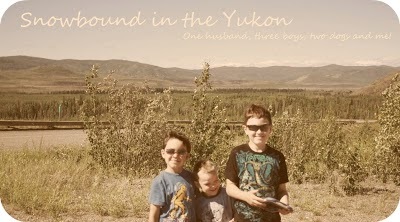 Snowbound in the Yukon: Saturday Morning Ramblings. Feeling tired and stressed out, sleep could help! Can't sleep maybe quitting smoking and giving up Pepsi can help! Doesn't work? Then I can't help you! I'm just rambling right now. I'm not sleeping well, I've given up two of my vices and I'm rapidly gaining weight. I'm feeling like a lump these days. Sleep deprived and eating too much to help with stress. What I need to do is walk my stress away but it feels hard some days to get out of the house for myself. I get out everyday but never for myself. It'susually to take one of the kids somewhere unless of course I'm going grocerie shopping which I do about once a week with a small trip in the middle of week to refill on fruit. So I'm not doing well this week, yelling to much, short temper, that kind of thing. I hate when I get like this. I need something, sleep or more exercise probably both. I only exercised twice this week and it was on the same day and right after one another. The kids are great though for the most part. I've been doing terrible with my Positive parenting, I'm trying but I can see SmartGuy relapsing, I have to get back to it. On the other hand he still amazes me this his writing and reading. Mickey is just being Mickey, crazy silly and using signs like crazy these days, it's really cool to see him communicate his thoughts. He still needs more though, I can still see his frustration on some days. Little One starting signing the other day, it was so neat to see because I don't think either of the other boys signed so early but I can see Little One trying to communicate already but when he signed I knew what he wante and that was so awesome. I'll try to get on later and write more. I've got a lot of things going in my brain right now and I need to get it out.